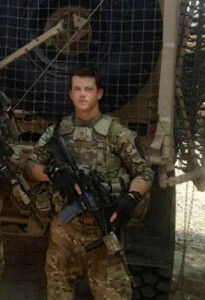 Staff Sergeant Gavin, joined the Army on 14 October 2002 and attended OSUT training at Fort Benning Ga. Upon graduating he was awarded the Military Occupational Specialty 11C (Infantry Mortarman). SSG Gavin, assignments include every echelon from Assistant Gunner to Platoon Sergeant. He has been deployed three times to Iraq (2004-2005, 200-,2008, and 2011-2012) and once to Afghanistan in 2013 where he was wounded when a 107mm rocket struck his position. He sustained several injuries from shrapnel and blast effects. SSG Gavin spent the next four months in Intensive Care Unit at Fort Sam Houston, TX. From there he was transferred to the VA Polytrauma unit where he spent the next few months learning how to do daily tasks all over again. SSG Gavin currently resides in San Antonio, TX with his wife the former SGT Stephanie Wallace.